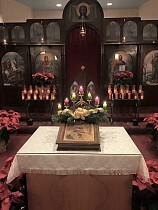 St. George Orthodox Church - Christ is Born! Glorify Him! Click on the view slideshow link to view a few photos of the church decorated for the Feast of the Nativity.